Mark Morris' choreography captures the full breadth of being human. For him, music elevates the quotidian into art. We can all walk or run to get somewhere, but when his dancers do so in time to music, it becomes a spirit-lifting pleasure. A jaunty tune provokes a hand gesture that can appear inelegant, but it's what the music asks for whether you're a professional dancer or a little kid. By the same token, a soaring melody can be visualized by a gravity-defying leap or an ecstatic leg extension that take full advantage of the years of dance training by each of Morris' dancers. 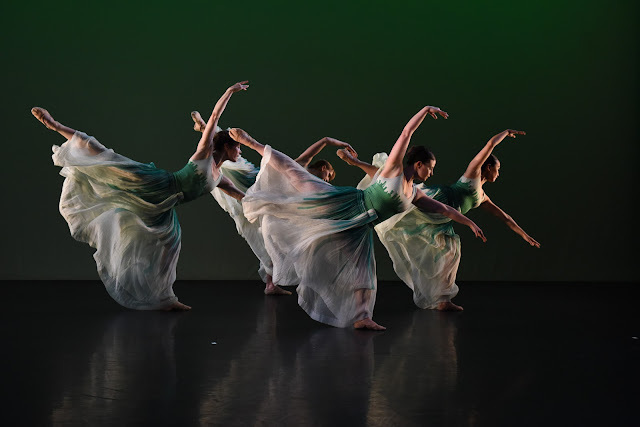 The two 2018 spring programs performed by the Mark Morris Dance Group showed the choreographer's range, in scale from intimate to large. Solos, Duets, and Trios (Program B) was a survey of smaller cast pieces and excerpts that fit naturally within the cozy studio venue. Lou 100: In Honor of the Divine Mr. Harrison (Program A) comprised another solo suite plus some large cast pieces to music by Harrison. Each program had one (more or less) premiere. Little Britten is built on a solo suite made by Morris for David Hallberg for last year's Fall for Dance. The Isaac Mizrahi toga-over-t-shirt is now worn by Lesley Garrison; she is joined by Brandon Randolph, sporting gym shorts, leg warmers, and a long chiffon scarf, and Aaron Loux, in a cropped bee-striped unitard. To piano studies by Britten, each song featured a movement motif, from a simple tendu with open face palms, to turns with an upper back arch, to exuberant extended-leg jumps. 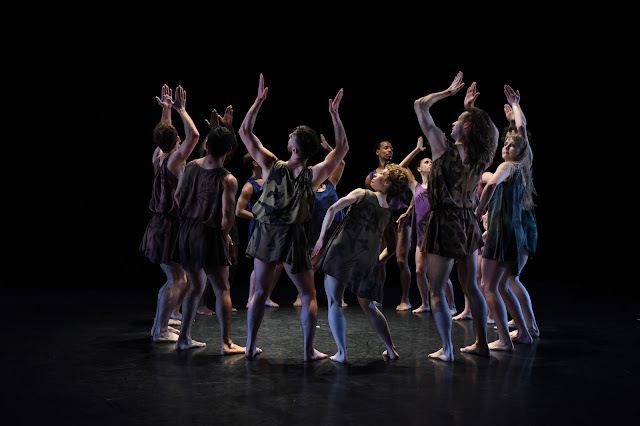 Morris has the ability to play with both quotidian and balletic movement, and is able to divine a relatable essence. On Program A, Numerator was a New York premiere using Harrison's fascinating Varied Trio for violin, piano, and percussion. Six men wearing brightly-colored camp shirts crawled on their bellies, crawled, and rose up to standing, like an evolutionary chart. Much of the piece uses big movement that eats up space. A man pretends to pass something to another; there are many lifts and partnering feats. The dynamic flicks between controlled and untethered. The pace builds until they're all moving swiftly and powerfully, their individual energies humming in a kind of spatial harmonic. The older repertory included the beloved and audacious Grand Duo. It is perhaps too large for the studio, but seeing it so close gave me a new appreciation for the hard work, speed, and machine-like cooperation on behalf of the dancers, whose precision prevents whacking one another. The mysterious opening features a double row of dancers crowding the apron, their semaphoring fingers shot with light, and the rousing, wheeling "Polka" finale invariably makes me want to jump onstage and join in (See? It's that thing he does, making you think you could do it!). Pacific, which opened the Harrison program, was made for San Francisco Ballet in 1995; the vocabulary is thus more classical, with lots of sweeping arabesques and turns (performed in soft ballet slippers rather than the usual bare feet). Serenade featured Garrison in a kabuki-like outfit moving through a series of seated and kinetic studies—just the arms and upper body, shoveling hands, and dense, detailed moves that echoed the guitar, percussion, and castanets (by Morris) played live onstage. In Program B, Morris put his castanet chops to further use in From Old Seville (2001), the only dance in which he performed in the run. This hilarious trio pits Lauren Grant—sleek and assassin-serious—against Morris in a faux flamenco dance-off. Morris seems more interested in the frequent drink breaks (poured by Noah Vinson) than the dancing, but never have more evil eyes been thrown in a modern dance. One Charming Night (1985) was another anticipated revival; Morris originally performed the role of the vampire, which this season was taken by his contemporary doppelganger, Dallas McMurray, dancing with the elegant (relative newcomer) Sarah Haarmann. Its lengthy bout of neck-biting seems a bit overly literal for Morris, but it showed McMurray's suavity and plush movement. These "studio shows" toe the line between full-out proscenium productions and more casual events. What is perhaps most appealing about them is the family-style atmosphere, with Morris and his staff and ex-dancers greeting people warmly, and down-to-earth technical director giving the pre-curtain "phones off, exits are there" speech as a bus driver might announce the next stop. In a good way, of course. And last but not least, kudos to the six fantastic musicians led by Music Director Colin Fowler, who accompanied every minute of the two programs.